There are several different ways to measure your horse for a Western cinch. NOTE: If you don't know how to measure your horse's girth, please see our article here: How To Measure Your Horse's Girth. That's darn close! The horse in the photograph wears a 36 inch cinch. A different horse we measured the same day had a 75 inch heart girth. Seventy-five divided by 2 is 37.5, minus 3 inches gives us an answer of 34.5. 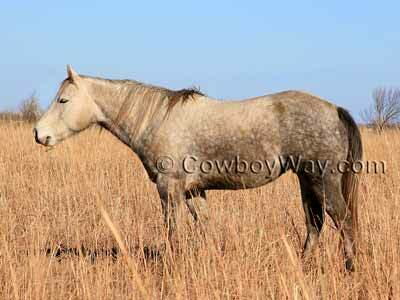 That's also very close - this mare wears a 34 inch cinch. Calculating your horse's cinch size using the method above is not always accurate. There are enough differences in saddles and horse body types to make any method of measuring for a cinch little more than an educated guess. Measuring an old cinch (if you have one) that fit the horse and saddle well would be a better way of finding out a good size for a new cinch, but that's not always possible. Of the methods we have tried, however, the one we described above has been the most accurate.